The annual International CES holds hidden gems and good advice for the enterprise. Having just returned from my 20th CES, I am often asked why an enterprise technologist attends an event that is geared towards consumer technology. The reality is that technology doesn't understand the differences between consumers and businesses. Consumerization trends at large enterprises continue to blur the line between what is a consumer technology and a professional or enterprise one. If one ignores most of the fads and hype-storms, then this conference provides an insightful 12- to 18-month look ahead toward where technology is heading. So while you may have read about the latest in self-driving cars and smartwatches in the mainstream media, here’s a taste of some of the items you might not have heard about that will definitely affect our workspaces for tomorrow. While most of the talk about display technologies was on the topic of 4K/Ultra High Definition (UHD) models with ultra-high prices, we also saw some of the new curved displays now available in desktop monitor sizes. Samsung called these displays “immersive” (an often misused industry buzzword) because of how compelling content on them becomes when it is slightly wrapped around the viewer. Expect to see these on power users' desks in the coming year. And speaking of power users and their desks, a company known as Stirworks wants to have desk-bound knowledge workers getting more exercise. They displayed their new Kinetic Desk that moves up and down at the touch of a control surface and can be programmed to raise and lower based on a preset schedule. The thinking is that the desk will force us to stand and move around for some time of the day because “sitting at a desk for 6, 8 or maybe 10 hours a day can't be good for us.” It is also a great idea for use in open-plan offices where a workspace can now vary between seated height or drafting height as the needs change. Another technology area to keep an eye on is ultra-wide angle “stitching” cameras. Some examples of this include the 360 Cam by Giroptic and the All-E from IC RealTech. These represent a new class of stationary cameras that utilize more than one optical sensor with very wide-angle, fixed-focal-length lenses (which have traditionally produced a fish-eye distortion.) The images are stitched together in the camera where the distortion is removed. These devices capture everything all around them. While that makes a great home-monitoring camera, a little creativity in applications can have this device hosting a virtual tour of anything. Want to sell a house? Just drop one of these puppies into every room. Want to join a board meeting as if you were there? Put one of these in the center of the table and look at whatever you want to – from a colleague's face to the slides being shown – and move around independently of anyone else connected to the stream from the same camera. Here is an Instagram video I shot that briefly shows this technology at work, being viewed on a tablet. We’ve all seen this type of virtual view before – on Google Maps or a product website – but those have still images and this produces live video. This class of device (at a cost of between $1,000 and $3,000 U.S.) has the potential to be a game changer. Robots were not as pronounced as they were at last year’s CES, but they were still around. 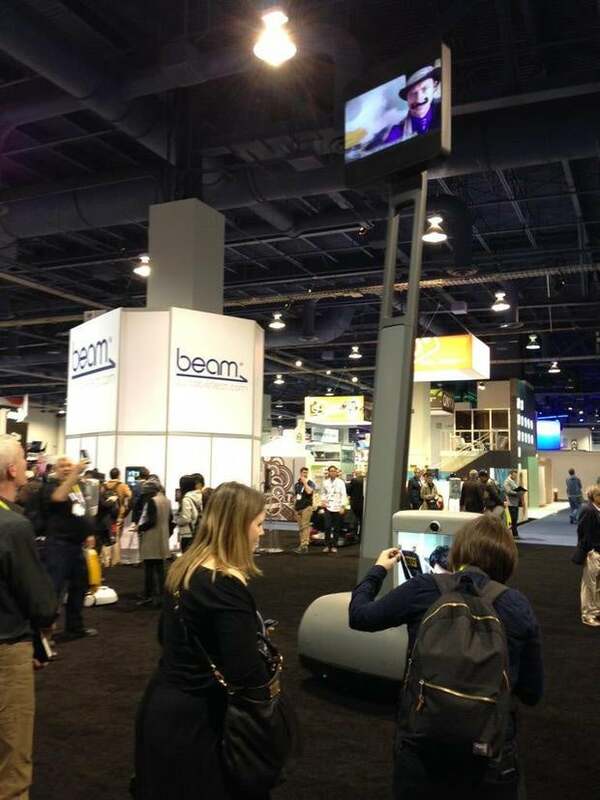 Here’s a two-story Beam Pro telepresence robot that was mocked up by its manufacturer to draw attention to the company's use of robotic video conference units. It was intimidating enough to command the attention of anyone passing by. I’m still of the belief that telepresence robots are mostly a solution looking for a problem, but there are a few applications (hazardous conditions, eyes for home-bound students, etc.) where they really have value. As we look to use these and other new technologies within our workflow, it is a good idea to keep the advice of Dr. Werner Struth of Bosch at the top of our mind. As part of the Fast Innovation: Disrupt or be Disrupted panel, he joined Cisco CEO John Chambers and Comcast Cable CEO Neil Smit to discuss technology innovation and how to manage through it. He pointed out that organizations must be willing to break their own paradigms in order to innovate. That means that even if the way things were done in the past are still working, enterprises need to embrace change and try new things to remain relevant in the future. With smarter working that includes both remote collaboration and activity-based planning, our future workspaces will look nothing like the current ones. Only by investing in these new models will organizations continue to thrive.